However, I can't seem to locate where my files are on the machine. All I'm seeing is this (image attached). Can someone point me in the right direction on how to access the share drives on my NAS? I'm really mostly looking to back up my business data and multimedia (flac) files, but I can't find them. You have to define the shares. Here is my code below. Ugh. I was hoping for something that was GUI driven. This is way above my pay grade. 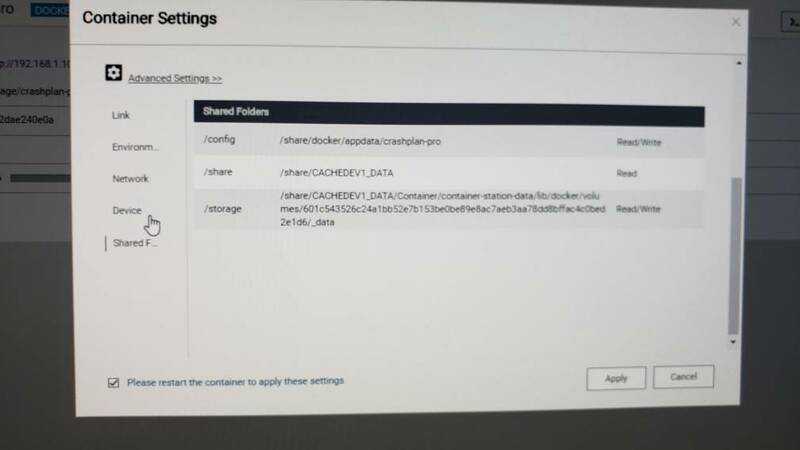 Is it possible to just get a regular Docker image with Linux and a desktop, then install the Crashplan app? You can enter everything in by hand in the gui as well. There is a shares tab where you can enter it. But, it's much easier to do it from a prompt. If you're on windows just download putty.exe and use it to connect to the NAS, then copy and paste that command to create the container. Depending on your NAS you might be able to install an OS, but that's way overkill. Yeah, I'm just not comfortable on a command line and experience tells me I'm better off with point-and-click. When you do this sort of stuff at work all day, it's intuitive, but not so much for me. And I can't deal with a scenario where, in six months from now, I need to add another share and can't remember how I got it to work in the first place. So, getting back to my original request, isn't there a GUI driven environment as there is with the Windows CP app, where I can just pick and choose the folders I want without having to resort to all sorts of command-line voodoo? No, as crashplan isn't officially supported on a NAS. Even if you setup a windows VM and installed what you are used to seeing, the VM still won't be able to see your folders without passing them to the VM. So you'll still have to pass the folders similar as to what's described above for a container. I haven't tried it, but you should be able to setup the container with the gui. Sounds like you already did that once, but forgot the simple folder share. Here are some screenshots for you on where to do it. You only need the /config and /share line. Also don't forget to set your max memory and timezone. Those are important! Tip, for some reason in the gui it's a bit goofy in that changing your settings requires you to delete the container and put it all in again. I haven't figured that one out, but you've probably seen my unsolved thread. So went you hit that create button, make sure you have it all in there and set to start at boot! Lastly, not to be persistent, but if you want to run unsupported software you'll probably have to learn a little commandline bidness. It's not my day job either, or my field, but being a little hacky will go a long way in NAS land. I store all my commandline text commands in a "things to remember" folder using notepad++. Really with the right code you just paste it and viola. In your screen shots, there doesn't seem to be a way to just add a share. I used a pre-configured Crashplan image downloaded from the ContainerStation control panel. I guess I'll give it another shot and see what happens. Is there any reason why I couldn't just run a Windows VM in Virtualization Station, add the NAS folders, and install the CP app. Then, they can't say it's not supported, and it solves all the mumbo-jumbo about command lines and whatnot. Last edited by Cincinnatus on Thu May 17, 2018 9:39 pm, edited 1 time in total. Once the VM is created you can't adjust the shares (my screenshot), but when you are in creation mode you can see there is an add button. Yes, you can install windows VM, but that defeats the purpose of a small lean container. You're gonna have to hit that add button, like it or not, and set up the shares so either the container or the VM can see your file system. can we even access the interface anymore with crashplan? I thought once the new version was pushed they broke our ability to connect to the back end from a pc? Did i miss something? Also learning to do it from the shell is not hard and will give you the easier ability to upgrade the container and keep your setting with a simply command. 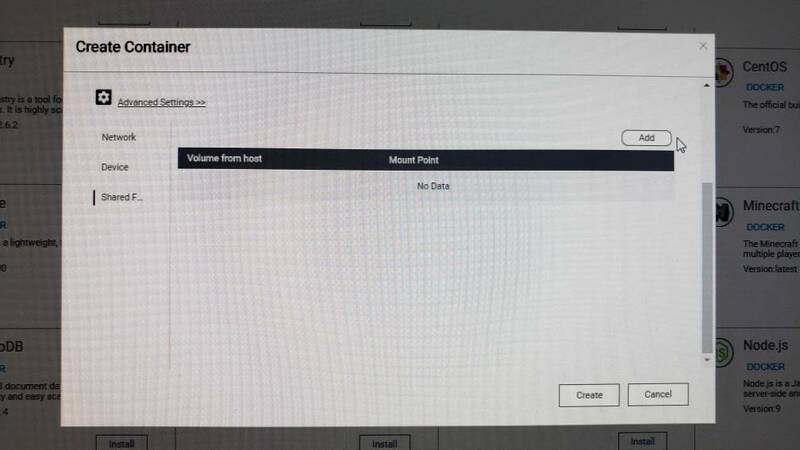 MikeLagit wrote: Once the VM is created you can't adjust the shares (my screenshot), but when you are in creation mode you can see there is an add button. Ok, managed to add two shares, but would prefer if the whole volume was visible, not just individual folders, so that if I add any new folders later they can be selected. Am I doing something wrong? As an afterthought, here's another point about why a full version of Linux might make sense. In the inevitable case where Code42 releases (and pushes) another update to their application, if the app is run on a desktop as a standalone app, it can be updated accordingly. I don't know if that's true of the docker implementation I've used. Am I thinking along the right lines on this? Not really. Docker makes it stupid simple and fast. Delete the container in the GUI. Once again, no GUI, so I have NO idea what's going on here. And, if I have to recreate the container all over again, doesn't that affect my existing backup settings? ETA: I just read a bit deeper into the documentation. If I'm understanding it right, if there's a new iteration/update of the app, all I need to do is destroy the container (without deleting the settings folder) and then recreate a new one. Is that correct? If you're going to do unsupported things on a NAS, you're gonna have to get a bit nerdy and learn a few things that a GUI doesn't support. Documentation is always good! and yes, that is correct on destroy and recreate the container. 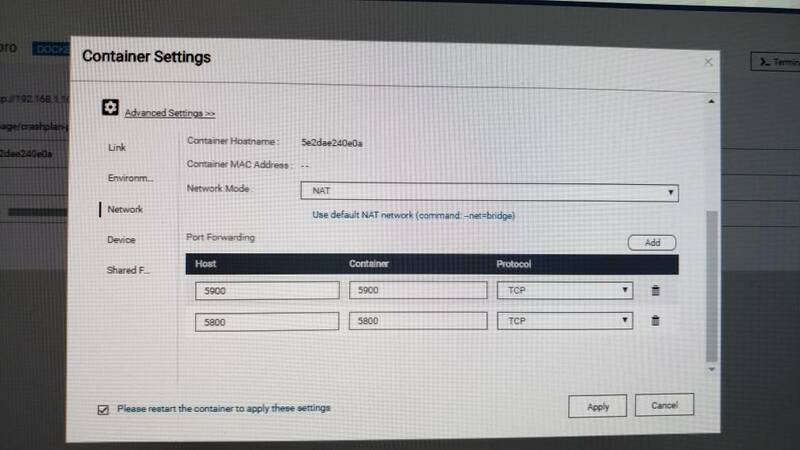 That is why there is a specific share to store the config outside the container. 3 step upgrade as I mentioned above and by far easier than any VM you could ever install or maintain. Further attempts to restart container result in it immediately stopping with the same error. It seemed like a permissions issue so I tried removing the config folder and starting from scratch again and the same sequence repeated. At this point I'm stuck., any pointers?